My new Jess Hutch bear. I made this one for myself. I love him. What else is going on? I’ve just been trying to keep up, to catch up! My bloglines is running out of control. So many great ideas have been sparked and now I’m just scrambling for time to try them all out. Right now I’m trying to learn how to draw with a Wacom tablet in Illustrator. Not an easy task. Especially since I can’t really draw at all. I need to figure this out though. There is so much I want to do. I’m working on drawing out the patterns for the booklets. I’m also trying to make something fun for my miniswap partner. Oh and trying to “help” Tim with the new site design. I need to put my H bear over here by the computer to be my cheerleader while I try to figure this stuff out. Speaking of catching up, check out all the great stuff from the Whip Up gals. They’re going to be keeping us very busy! Another crafty blog development, a sad goodbye to one of my favorites, Little Birds. I’m really going to miss checking in on her beautiful site. At least we’ll soon have her etsy shop! I hope to console myself with one of her little lambs. I love the H Bear! I think he’ll make a stellar cheerleader! Oo, I’ve got a wacom tablet… and I’ve even used it, just never thought to use it for craft drawings (duh). Up to now, I’ve been sketching in pencil then scanning that in and tracing over it in Corel Draw (an ancient version, too). I’m such a bad artist at this point still that I *neeed* the pencil&eraser time. oh i love my wacom! you won’t regret the time you’re spending on learning it. I’m not fabulous at it but it’s a nice alternative to scanning. That is a fabulous bear. And your craftroom looks amazing too. Mine is messier, and somehow lumpier. And, finally, we are making something fun for you too! Love the bear…my bloglines is overflowing too….it’s pathetic how behind I am. Glad I’m not the only one! Love the bear,the colours are gorgeous. Good luck with the wacom. Your bear is so cute. 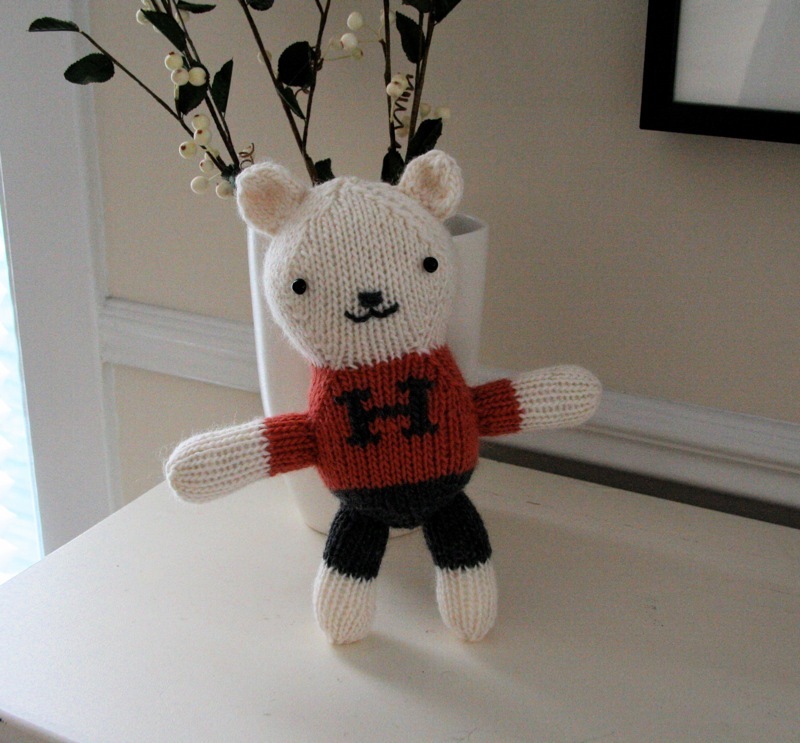 I just finished my on Jess Hutch bear, too! Your’s is so very nice. this is what i’m going to do with my new non-blogging time: finally make something from jess’ booklet. hoping it turns out as cute as your bear. thank you for your kind words. i’ll still be hanging around ww! To get everything nice and neat, I’d use the Pen tool in illustrator rather than the pencil. You press down and drag, and it gives the anchor (the ‘dot’) little arms which you can adjust to make your shapes. Then let go, click and drag where you want your next anchor. It gives really smooth curves, and it’s easy to ammend. Oh, and I love your bear so much that it makes me cry. He is so cute!!!! Great job!!!! He’s a cutie!!!!!!!!! I just got the booklet by Jess and was going to start my little bear today! How long did it take you to make him? everyone needs a good cheerleader in their corner… I think he’s perfect! i love your little bear. i have jess’s booklet and i’ve enjoyed the projects i’ve made. they’re fun aren’t they. Oh. I just love your bear! I have her book too but I’m such a beginner I’ve been afraid to start something. I just look at all the cute little critters! I’ve heard about the Wacom tablet before. At one time, there was so much discussion about it that I almost bought one. I didn’t though. I found a Gocco printer at Goodwill and still had to learn to use it. As I’m writing this, it seems like I have a hard time jumping in. Maybe, I need a cheerleader bear like you! You go girl!